Canada Loan Shop is the best option to choose in your financial crisis to fix the issues in minutes. If you are in British Columbia and want an instant financial solution then we can help you through Car Title Loans BC and surrounding areas. There is no upfront fees, no credit checks but an immediate response from our team of professional loan representatives. You can borrow up to $65,000 on the basis of your vehicle’s value and condition. Your vehicle’s lien-free title is used as loan collateral in exchange for the needed cash. You can keep driving it for the entire duration of the loan. We provide vehicle title loans and bad credit car title loans regardless of your credit. We offer the most flexible payment plans with manageable affordable monthly payments. The borrower simply has to provide a clear vehicle title, proof of permanent residency and a valid Canadian driver’s license to get approved for auto title loans BC. We offer the most flexible payment plans with manageable affordable monthly payments. Canada Loan Shop is always available to assist at every stage during the entire loan process. 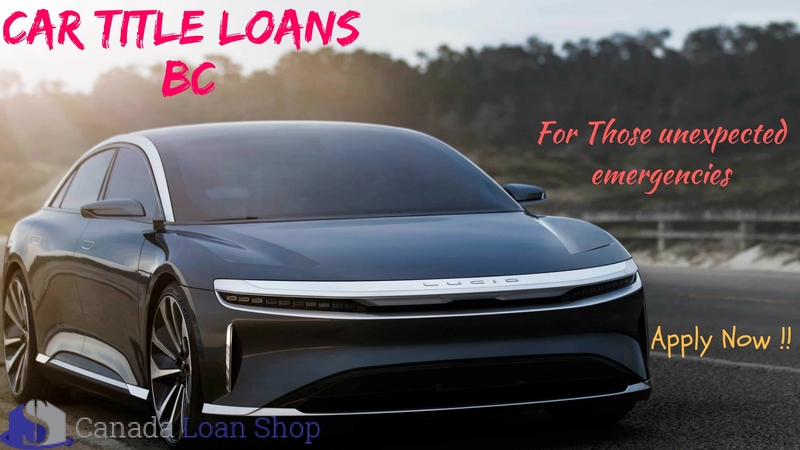 Contact Canada Loan Shop (Toll-Free) 1-844-572-0004 To Apply For Vehicle Title Loans BC!